Today I'm writing about mice, the sort that you control your computer from. It's a solidly geeky post, so if you don't want to read about mouse, here's a story about cats. I think I got the G5 originally at a LAN party years back, and it didn't disappoint. 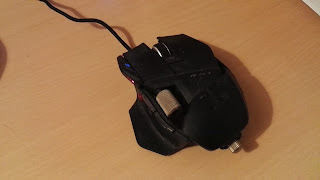 But sadly, eventually after many years of use (and I mean many - it lasted a lot longer than the Logitech G15 keyboard I bought around the same time, for three times the money! ), it became less responsive and a replacement was in order. I turned to a Microsoft Wheel Mouse. Microsoft mice aren't something you'd immediately think of as a gaming mouse, but they're decent quality, reliable mice. 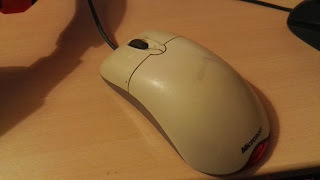 I did work experience for a few months at Hull College as a student, and at the time a Microsoft IntelliMouse was a good piece of kit to get your hands on. 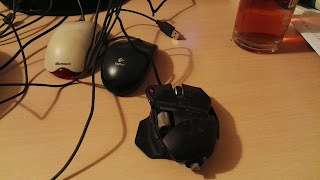 Having an optical sensor rather than a ball made the mouse more accurate, not prone to jamming up with dirt, and couldn't be sabotaged by one of your college mates taking the ball out. I had a Microsoft mouse in my box of computer bits, so it was put to work, and again was fine to work with for a while, until it too started to play up. Then, like a fool, I thought "Hey, that Logitech G5 was amazing, another Logitech must be great!" 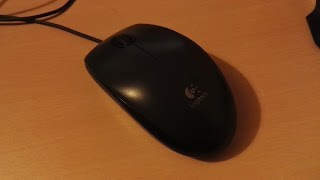 The Logitech M100. It's evil, it clicks, and it's nasty. Now before you think all Logitech mice are rubbish, this is one of their cheapest (if not the cheapest) one that Logitech offers. Having a quick look at their shop, I see some REALLY nice mice. But this isn't one - it's light, it's a little too small, it scrapes over the desk, and the scroll mouse making a really noisy clicking sound when in use, like a row of cockroaches being stood on. I'm now using a Cyborg RAT 5 mouse which I got with my current computer, I wasn't overwhelmed by the shape of it when I first saw one of these (at another LAN party) but now I'm using one I have to admit it's pretty nice, it's solid and comfortable, and even has a nice little shelf to rest your thumb on in between clicks. I'm finding it occasionally a little unresponsive but I'm not sure if that's down to the mouse or something computer-related. One day, however, I will buy myself a really good Logitech mouse again. One day. Currently I am the owner of a Logitech mouse & I love it. I will sing your praises, Mike. It is bad to be the victim of a mouse with a secret agenda.